However, the co-feature pitting junior middleweight titlist Kassim Ouma against Kofi Jantuah — in a rare title fight between African-born boxers — also has action fight written all over it. Ouma (No. 7 USA TODAY, 20-1-1, 13 KOs), the happy-go-lucky titlist from Uganda, will be making the first defense of the vacant title he won in an October rematch against Verno Phillips. Ouma has been in a string of exciting fights and throws punches non-stop. "Are you ready to see me in Atlantic City? I'm coming, and do you know what I'm doing? I'm going to steal your whole city and your whole show," Ouma said on a media conference call. "By the time I leave Atlantic City, the whole city will be mine. They may have to give me the key (to the city) after the fight." 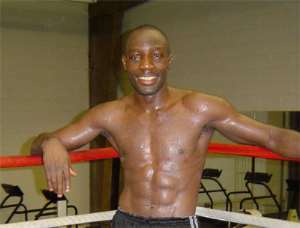 Jantuah (28-1, 18 KOs), a native of Ghana who learned to box from countryman and Hall of Famer Azumah Nelson, also is a crowd-pleaser, even if some fights have been over in the blink of an eye. He earned the title shot with a first-round, one-punch knockout of heavily hyped Marco Antonio Rubio in September. Jantuah, too, is predicting action. "I want him to be there, and I will be there. I come forward, he comes forward and we will give the public a fight," he said. Cutman Joe Souza had to make a tough choice when Gatti-Leija was signed. He's worked for both fighters throughout their careers. Both have credited him for saving them in fights during which they have been badly cut. Souza opted to work with Leija, whom he's been close to since Leija was a child. Gatti will have Danny Milano in his corner with trainer Buddy McGirt. Milano was McGirt's cutman when he was an active fighter. "I've known Joe Souza since I was 2 years old. He is family," Leija said. "He trained my father in the late '60s, early '70s. But I was going to let him make that decision. He thought it would be wise if he went with me. Plus he's (also) from San Antonio, and people would hold that against him if he went with Gatti." Gatti understood Souza's decision. "It is out of loyalty, so I respect that," he said. "He's been with James for a long time, since the amateurs." Promoter Don King has reached agreement with middleweight star Felix Trinidad and junior middleweight champ Winky Wright to fight May 14 (HBO PPV) at the MGM Grand in Las Vegas. Trinidad will earn $10 million for the non-title bout. Wright, who will move from 154 pounds to 160, will earn about $4 million and sacrifice his WBC title. The WBC announced it would strip Wright if he faces anyone other than interim titlist Javier Castillejo. Heavyweight contender David Tua, idle since a draw vs. Hasim Rahman in March 2003, returns March 31 in New Zealand against Talmadge Griffis. Tua, who lives in New Zealand, sat out while in a lawsuit with his managers. In his only title shot, Tua lost a decision to then-champ Lennox Lewis in 2000.